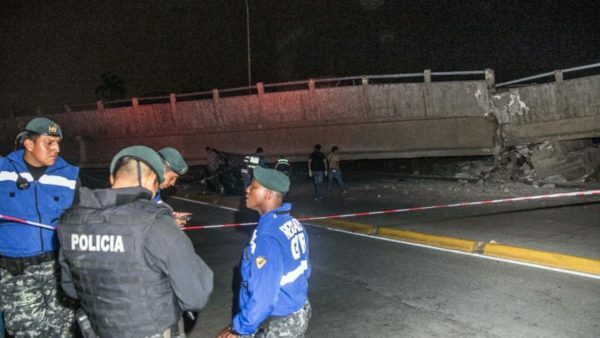 At least 77 people have been killed and more than 500 injured after a powerful 7.8-magnitude earthquake struck Ecuador, Vice-President Jorge Glas says. The tremor struck at 18:58 local time on April 16 near the northern coastal town of Muisne. Widespread severe damage is reported, with a bridge destroyed as far south as Guayaquil about 190 miles away. A state of emergency has been declared in six provinces and the National Guard has been mobilized. The earthquake, Ecuador’s largest since 1979, also shook buildings in the capital, Quito. VP Jorge Glas said that at least 77 people had died and 588 had been injured, adding that the figures could rise as a number of affected areas had not yet been reached. He called for calm, particularly in the city of Portoviejo, amid reports of a “lack of public order”. He said dozens of buildings had been flattened and looting had broken out. “This wasn’t just a house that collapsed, it was an entire town,” he added. Serious damage was also reported in the city of Manta, with an airport tower among the buildings destroyed. The US Geological Survey said the quake struck at a fairly shallow depth of 11.9 miles, about 18 miles from Muisne in a sparsely populated area. There have been a number of aftershocks, the biggest at 5.4. The Pacific Tsunami Warning Centre has now issued a message saying that the threat of a tsunami has now mostly passed and that any remaining risk should be evaluated by local authorities. However, it earlier said tsunami waves reaching 0.3 to one meter above the tide level were possible for some coasts of Ecuador. Any damage that had occurred might not be visible until daylight. Parts of the capital were left without electricity for some time. Reports say a big oil refinery has been temporarily shut as a precautionary measure. Neighboring Peru had also issued a tsunami alert for its northern coastline. The quake was felt in Colombia, where patients in a clinic in the city of Cali were evacuated from the building as a precautionary measure. Ecuador is prone to earthquakes. It is located along the so-called Ring of Fire, a horseshoe-shaped, seismically turbulent area of the Pacific Ocean.